Dicamba-resistant soybeans in rural McLean County on August 7, 2017. If the Illinois Department of Agriculture sees an increase in complaints related to the herbicide dicamba this year, state agriculture officials worry lawmakers may consider banning its use altogether. “If this year we see that number of complaints go up again, that’s going to be very disturbing to everybody,” said John Sullivan, acting director of the Illinois Department of Agriculture. “There’s a concern that this product, dicamba, there’s a chance it’d be taken off the market all together." The state announced new restrictions March 1 on the chemical, which has been available for use on soybeans since 2017. It’s been used to prevent weeds in cornfields since the 1960s. Illinois grows more than 20 million acres of soybeans and corn each year. 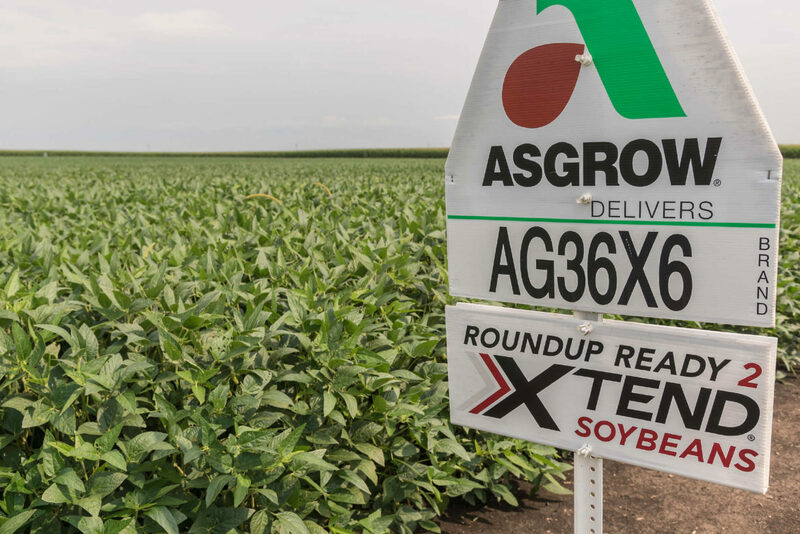 Varieties of the herbicide are manufactured by BASF, Bayer Crop Science (which recently purchased Monsanto) and Corteva Agriscience, the agricultural division of DowDuPont. Dicamba has been incredibly effective at controlling weeds that have grown resistant to Roundup and other pesticides. In recent years, dicamba has also caused damage to specialty crops like wine grapes and tree fruit, non dicamba-resistant row crops like cotton and soybeans and other non-agricultural plants and trees. Farmers from the Midwest, including Illinois, have filed dozens of lawsuits against Monsanto (now owned by Bayer) and BASF seeking relief from alleged damage from dicamba. The lawsuits have since been combined into one class action lawsuit against the companies, which remains pending. “We lead the nation last year, as far as I can tell, in official complaints, and that’s a little unnerving,” said Aaron Hager, associate professor of weed science at the University of Illinois. In 2018, Illinois saw 330 complaints related to dicamba. In 2017, there were 246 complaints. Sullivan said reducing complaints of damage from dicamba in 2019 is crucial, for both farmers and the non-agriculture community. The new measures, he said, are meant to protect production agriculture in the state of Illinois as well as give everyone confidence that the state agriculture department is looking out for all residents. Ryan Rubischko, North American dicamba lead for Bayer Crop Science said the state’s additional requirements were not warranted, as they were redundant with many of the federal regulations implemented by the Environmental Protection Agency. “We think that, based on the science, there is not additional restrictions warranted, beyond what is already been thoroughly vetted and reviewed by the EPA,” said Rubischko. The new Illinois rules would prevent application of dicamba after June 30 in the state and include additional buffer zones around fields that are near residential areas and sensitive crops or plants. In the last two years, the number of complaints about all pesticide damage filed with the Illinois Department of Agriculture has grown exponentially, from an average of 133 a year to more than 500 in 2018. More than 300 of those complaints were related to dicamba. Rubischko said the trend Illinois is reporting does not match what Bayer and before that, Monsanto, has heard from farmers and professional applicators who called the complaint number on the pesticide label. “In the state of Illinois, we had received 778 inquiries in the 2017 season, whereas in the 2018 season we experienced 183 inquiries where farmers called us and said, 'Come out here, I have some symptomology,'” said Rubischko. He said mandatory training, along with a push to use dicamba earlier in the season, when damage is less likely, is what will reduce complaints. “I think the training and education is critical,” he said. Hager said Bayer’s data showing a drop in complaints does not reflect what's happening across Illinois' farmland. “The misinformation campaign from the former Monsanto, is doing nothing to help resolve the issues off-target movement of dicamba. These numbers are misleading, and in the big picture, have absolutely no relevance on the regulatory aspects of this product in the state of Illinois,” said Hager. He said the drop in Bayer’s complaints may be because, in 2017, when farmers called the number on the label, they may have thought they were calling the official EPA complaint line or the Illinois Department of Agriculture, not the chemical manufacturer. Rubischko attributes the difference in numbers to a change in the way the state of Illinois handles pesticide complaints. An Illinois Department of Agriculture spokesperson said that, while the agency did refine the complaint logging and tracking process in order to help process complaints more efficiently, the changes would have “a very minimal impact, if any at all,” on the trend in dicamba complaints. Many of the complaints in 2017 and 2018 were from farmers who said they experienced damage to their crops from dicamba applied to neighboring fields. But complaints from farmers actually went down from 2017 to 2018. Meanwhile, Hager fears the number of complaints from non-farming neighbors and residents will continue to grow. “Agriculture needs to understand that, when it comes to pesticides and the public, it’s not a conversation that’s restricted only to the agricultural community. It’s not going to work that way,” he said. Illinois is addressing these issues by creating larger distance requirements when residential or other sensitive areas are downwind. Rubischko said Bayer is promoting early application of dicamba to cut down on complaints. If farmers apply the chemical when it’s cooler and weeds are still small, the chances of drifting are diminished, and the likelihood of completely killing the weeds is increased. An analysis of complaints by the Midwest Center for Investigative Reporting shows that, in 2017, 65 percent of complaints were filed in July and August. Last year, 48 percent of complaints were filed in those months. Sullivan said the state hopes the June 30 cut off date will still allow farmers to utilize this pesticide, while keeping its use to cooler weather, when off-target movement will be less likely. The unknown factor in 2019 is the weather. In 2017, only 22 percent of soybeans in Illinois had been planted by May 13, compared to 66 percent in 2018. Later planting in 2017 pushed dicamba application, and complaints of damage into July and August. Earlier planting and dicamba application may be why more complaints were logged in June of 2018. The three-month forecast from the National Weather Service shows a 33 percent probability that Illinois will have more precipitation than average through June. That means early planting could prove challenging, shortening the window Illinois farmers have to apply dicamba to soybean fields. Recent flooding and wet weather across the Midwest could also delay soybean planting and dicamba application. But even if farmers spray dicamba before June 30, there's a chance the state will receive complaints on damage into August. It can take up to two weeks for plants to show signs of damage from dicamba, and Illinois residents have thirty days after they see the damage to file complaints. Rubischko said that, anytime someone sees damage to a crop or plant, they should get the facts before assuming dicamba was the cause. “There’s a number of different factors that can cause leaf cupping of soybeans. It could be environmental, drought stress, things like that. There could be other pesticides,” he said.